This article - my first real submission – presents an abridged and retrospective narrative on the content of my Master’s thesis, completed in September 2015. It serves as a useful first-post as it comes to contend with, quite concisely, one example of those ‘unrepresented realities’ of architecture I speak of in the introduction to this platform. The drawback to having this as my first-post, however, is that it might give the reader somewhat of a false impression of the depth of research to expect elsewhere on this platform. I am not going to be going into nearly as much depth as I did for my Master’s thesis. This is not something I can really maintain, nor do I want to. I wish to occupy a more flexible and responsive space than that of academia. Yet, at the same time, I do want to bring a certain level of criticality to bare on the contemplation of architecture within the public sphere. 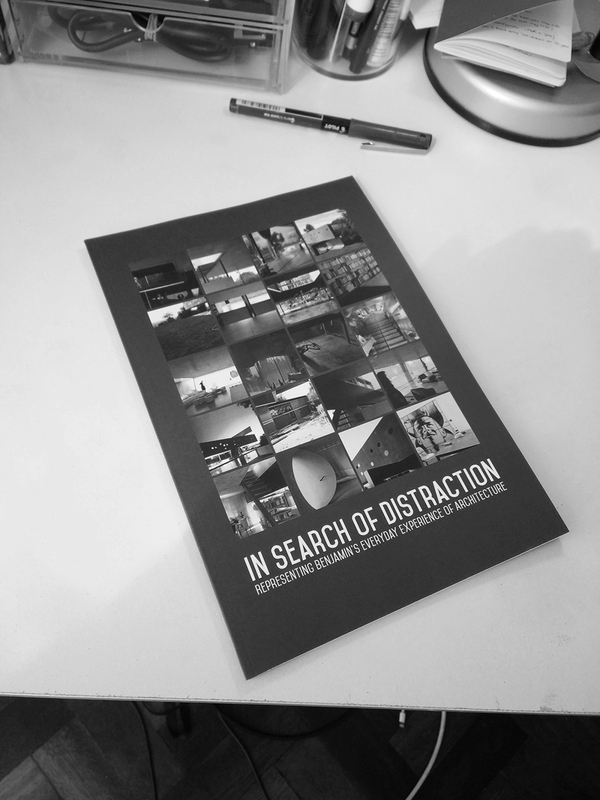 The original title of my Master’s thesis was, ‘In Search of Distraction: Representing Benjamin’s Everyday Experience of Architecture’ and the question I sought to address was: can the paradigm of architectural experience, its perception in a state of ‘distraction’, be registered through representation? This was considered one aspect of architectural criticism that was concise enough to fit within the limitations of my Master’s thesis and necessary to be addressed before we may know if any critical evaluation may ultimately take place. The concept of ‘distraction’ was one taken from Walter Benjamin’s 1936 essay, ‘The Work of Art in the Age of Mechanical Reproduction’, and thus required some substantial contemplation in order to extract it from its out-dated and politically embroiled context. The concept of ‘representation’, too, needed some careful consideration due to the apparent paradox it held for the depiction of ‘distraction’ – a condition seemingly antithetical to the attention present at either side of its two-fold structure. Ultimately two isolated methods of registering ‘distraction’ were established and their retrospective occurrence across existing sites of representation evaluated. From this, I determined that a seemingly enigmatic condition of perception, such as 'distraction', may be captured (at least to varying degrees) by utilising modes and methods of register that operate outside the norms of architectural criticism. This is, of course, what this platform (Openly Critical) responds to. [W]e know poorly the types of operations at stake in ordinary practices, their registers and their combinations, because our instruments of analysis, modelling and formalisation were constructed for other objects and with other aims. Of course, I was aware then, as I am still, that architectural criticism, as it is conventionally conducted, is a practice that occupies an important place in Western culture and cannot be abandoned. Yet, my concern arose in response to the sheer prevalence of its paradigmatic form in the face of the distinction nature of architecture’s prevailing reality – as experienced in everyday life. Architecture is unlike those other objects of criticism, such as art, whose representation and contemplation in the pages of journals and magazines is an fair reflection of their typical engagement in everyday life. Art is, typically, an object isolated from its context, understood in relation to a network of knowledge and, perhaps most crucially, engaged with out of election and not habit. Indeed, it is the long legacy of art criticism that is believed to be responsible for the inappropriate way in which architecture is dealt with in its own critical space. The analysis of buildings and spaces in the city often proceeds without questioning the mechanism of their reception. Models borrowed from the languages of art history assume the attitude of the architectural spectator to be similar to that of the viewer before a sculpture or a painting. Architecture is, as I penned early in the development of my research, not the artwork that occupies the gallery wall but rather the wall, and the gallery as a whole, as the artwork itself is engaged with by the spectator. It is this subtle perception of architecture that fascinated me – and still does – and what led me to suggest that a mode of criticism should be established to respond to it. However, as I mentioned in the introduction to this article, the limitations of my thesis required my ambitions to be made more modest and so I came to focus simply on the representation of ‘distraction’ instead. What I saw as one of the initial concerns of architectural criticism - something required before any critical response may take place. Buildings… are appropriated in a twofold manner: by use and by perceptions – or rather by touch and sight. Such appropriation cannot be understood in terms of the attentive concentration of a tourist before a famous building… Benjamin points us to a fundamental distractedness of architectural experience. This notion of a tourist-like position I felt encapsulated the attention of the architectural critic, with that of ‘distraction’ an opposite condition reflecting the perspective of the everyday person. Later, I would realise, through a secondary and less hasty reading, that Grillner’s own motivations in that essay were in fact aligned with my own. She, with a less constrained space than I, considered the potential implications of conveying such a mode of attention in critical writing – albeit with little conclusive findings. The main part of my research now fell onto Benjamin’s ‘Work of Art’ essay, which with its complex content and delicate political context, made a clear understanding of his postulations on architecture difficult to at first understand. Only once had I read it and reread it in conjunction with an earlier version and third-party critical commentaries, did I establish just how shallow a role it played in relation to the real object of Benjamin’s writing: his thesis on the revolutionary potential of montage cinema. Here, Benjamin considered montage as a profound technique capable of establishing a collective yet critical state of ‘distraction’ in the masses, which, at the time, he believed was able to thwart the rise of fascism and ultimately the threat of war. It is important to note here, given Benjamin’s relationship to montage elsewhere, that within the ‘Work of Art’ essay, montage was considered not for its allegorical potential, composed via the sequence of its content, but rather for its shock-like effect on the attention of the spectator, induced instead via the dynamism of its operation; the arresting effect of rapidly changing and contrasting scenes. Such examples can be found particularly within the films of Russian Constructivists like Sergei Eisenstein and Dziga Vertov. Architecture is, I would learn, only then introduced by Benjamin as an existing model of ‘distracted’ perception, which, for him, existed at a level of ubiquity within the human condition to be matched by this other form 'distracted perception' in order to fulfil its revolutionary potential. Having understood all of this, Benjamin’s concept was finally dusted down and considered in line with the contemporary context of my research. I therefore established, as Benjamin had himself suggested, that the condition of architecture’s everyday appropriation in a state of ‘distraction’ was a timeless one and, corresponding with the sentiments of Richard Hill, may be taken as the paradigm of architectural experience. I also made a similar expansion to this concept of ‘distraction’ as Grillner did, considering architecture not as an object in life but rather as a background to life. Rarely perceived in and of itself. At this point I shifted my attention onto the second key notion of my research, that of ‘representation’. 'Representation' is a vast and complex field of study, even within the sub-sphere of architecture, yet in order to achieve what was needed it was necessary to contend with its general character rather than its nuanced aspects. 'Representation', I established, was responsible for constructing a two-fold relationship between a subject and object that did not otherwise occur. This, as I have tried to illustrate below, presented an apparent paradox to my research, with either side of its two-layered structure seemingly antithetical to the required state of ‘distraction’. For both the delineation of the object for representation and its engagement by the spectator are, I suggested, typically conditioned with 'concentration' in the process. It soon became apparent, therefore, that a ‘complete’ representation of architecture, as perceived in a state of ‘distraction’ was likely an impossible task – indeed we might say the same for any such object. Yet, I thought that by mediating the attention active at each part of the process of representation, at either side of its two-layered structure, the distracted perception of architecture might be allowed to shine through, if only to a marginal degree. By following this methodology of ‘mediation’ and in response to my earlier findings, I established two methods I believed were capable of registering this condition. The first, ‘narrative’, acts on the left-hand side of this structure, mediating the delineation of the architectural object. By using narrative (accounts of human experience), the object of representation was shifted away from the architecture and onto the user, to whom the environment is rendered passively as it rises and falls around them - creating, in my mind, an analogous portrayal of architecture’s everyday experience (in a state of 'distraction'). ‘Montage’, on the other hand, acted on the right-hand side of this structure, mediating the reception of architectural representations by the spectator. This was derived from the wider theory of ‘distraction’ present within Benjamin’s ‘Work of Art’ essay, which (contestably) held the symptomatic state of ‘distraction’ induced by montage, synonymous with that present in the habitual appropriation of architecture, despite the substantial differences in causality. It was therefore considered that by arranging representations of architecture in montage compositions, a similar state of ‘distraction’ could be induced in its reception here as it is in everyday life. Having established the outline potential of these two methods, I then undertook a delicate and critical investigation of their character in order to determine in what form and across which media they would be best suited to the portrayal of architecture’s distracted appropriation. ‘Montage’, for example, was seen as capable of functioning to its hypothesised end provided its content was sufficiently contrasting and transient. Although, there was a potential opportunity for a static form of montage, a college (or ‘spatial montage’), to work, provide the frequency of images were substantial enough. ‘Narrative’, on the other hand, was seen as most effective across forms media possessing a continuous temporal element, such as writing or film, and from a first-person perspective. To test these devised methods I chose an existing site of architecture as my object and examined some selected forms of unorthodox representation to it that bore, retrospectively, at least some of the qualities I had hypothesised. This ‘object’ was the famed work of late 20th Century architecture, the ‘Maison à Bordeaux’, designed by OMA (Office for Metropolitan Architecture) for the specific needs of a paraplegic man and his family, in Bordeaux, France. Incidentally, the building itself has been considered by some as something of ‘montage device' due to the visual perception acquired through the operation of its central platform lift. The example of ‘narrative’ representation chosen was the 2013 film, Koolhaas Houselife, by Ila Bêka & Louise Lemoine. The below extract, from the scene 'curtains', is show unlike it was in my thesis (due to the limitations of its format) as a film, thus maintaining its crucial temporal character. Here, I observed what I perceived as two qualities of ‘narrative’ present within this representation: a third-person perspective and a first-person perspective. The third-person perspective is present in the close documentation of the film’s protagonist, Guadalupe (the housekeeper), who by habitually interacting with the building as she goes about daily duties, demonstrates to us its ‘distracted’ appropriation and engagement from an outside perspective. The first-person perspective, however, is present in the mobile and loose filming method, which focuses not on the building itself but on the actions of Guadalupe. This, therefore, reflects not only habitual visual perception in ‘distraction’ but, most importantly, the perception of architecture as it exists at the periphery of an alternative focus. Not as an object in itself but as a background perceived in a state of ‘distraction’. The following example of ‘montage’ really was an unorthodox one to chose, for its existence as a site of ‘representation’ at all was formed solely from my own extrapolation of Lev Manovich’s comments on the way in which a computer typically operates. That is, with a montage-like dynamism to its GUI (Graphical User Interface). I identified, subsequently, that the popular ‘image search’ function undertaken online was indeed a form of (spatial) montage and should be recognised as a site of representation in itself. 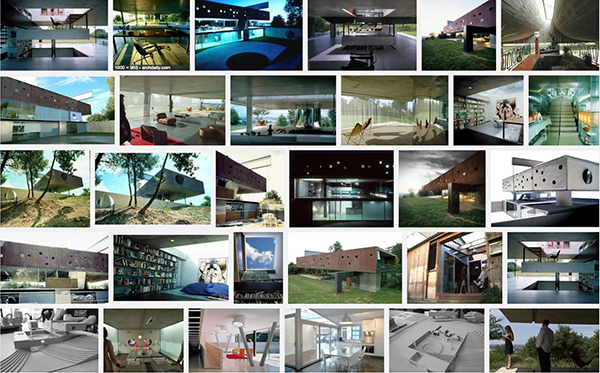 Snapshot of a “photo-collage” created by a Google “image search” for the criteria: “Maison à Bordeaux photograph”, on the 16th of June 2015. Here, I observed that, despite being a ‘spatial montage’, lacking the temporal determinism of its occurrence in film, it was able to engender a sate of ‘distraction’ in its reception due to the sheer frequency and lack of uniformity of its images. However, considering what I established as the relative inadequacy of a 'spatial montage' for this purpose, it was not as effective as it might have been in another form. This is due to the active role the viewer has in its temporality. By focusing on one particular image and not allowing a fleeting scan over the whole to take place, the viewer can circumvent the arresting effects of this montage. The ideal example, which I have since established below, would have been a temporal montage of the ‘Maison à Bordeaux’ but there were no existing sites of representation that pertained to this nor was there the appropriate 'space' in my thesis to demonstrate it. A temporal montage of the 'Maison à Bordeaux' produced with the photographs returned from a 'Google' image search. In conclusion to my thesis, I remarked first of all on comparative success of the ‘narrative’ method in relation to ‘montage’. Which, as I suggested already, was largely due to the analogue it held within the condition it intended to capture. Whereas ‘montage’ simply sought to induce a similar state in the reception of architectural representations that were otherwise captured in a state of ‘concentration’ (the photographs used in the montage compositions). Indeed, this was not the only limitation of ‘montage’, for it also suffered from the tentative conditions of its operation, particularly in its static (or spatial) manifestation, and, in general, from Benjamin’s supposition of two binary states of attention, either 'concentration' or 'distraction'. Which, in retrospect, is a difficult premise to confidently adopt and perhaps, more likely, we might observe instead other more nuanced states of attention that exist either between these two poles or as sub-sets of them. I also highlighted, as a caveat to the perceived potential of 'narrative', concerns I had of its manifestation for the primary purpose of representing architecture. Using 'narrative', architecture is intended to be registered passively by the narrative agent, yet by constructing such representations for the direct purpose of depicting architecture, might, I suggested, unwittingly undermine this. As an alternative I posed, instead, the potential repurposing of existing works of narrative, sourced outside the remit of architecture and, in line with my findings, suggested that the best opportunity for this might come from first-person video footage. Such as those that are now abundantly available online due to the proliferation of personal filming equipment (like ‘GoPro’ cameras) and free platforms of distribution (like YouTube), examples of which I have since sought out and posted below. The final remark I made in conclusion, which actually came back to the departure point of my research (and now the start of this article), was concerned with the general inability of existing sites of criticism to accommodate such alternative perspectives of architecture as ‘distraction’. I recognised that this was not only a limitation of habit and expectation but also of technology and imagination. In response, I called for the near limitless potential of online space to be utilised instead for this purpose. To glean and distribute unorthodox perspectives without restrictions, without pandering to the readership or the limitations of a platform (tangible enough in print but less so online). This is, of course, where this platform, Openly Critical, comes in. Which, as I mentioned in the introduction, benefits from these characteristics but also seeks a sense of critical rigour to counteract the typical shallowness of material often distributed online. This platform aims to occupy an in-between space, to provide a bridge between the diversity and responsiveness of online information and the critical authority of academic work. That is, without succumbing to the superficiality sometimes witnessed in the former or stuffiness in the latter.